News in now from Camper & Nicholsons that James Rayner has closed the sale of the 27.4m motor yacht Loretta, with Sanbo Marine bringing the buyer. 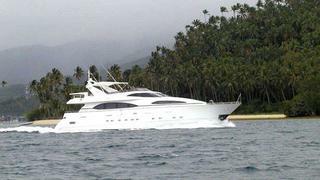 An Azimut 90 built in 1996, Loretta features a well-appointed four-cabin layout for eight guests. Her outdoor deck areas host a Jacuzzi on the flybridge, alfresco dining area and tender garage housing a jet ski and tender.